Figure 6.15 Occurrence of angiosperm pollen in samples from the Pyramid Butte section (from Nichols and Johnson 2002). HC = Hell Creek Formation, FU = Ludlow Member of the Fort Union Formation; stars designate species usually restricted to Maastrichtian rocks. Reprinted by permission. in age). This facies effect tends to reduce the numbers and relative abundance of K taxa in lignite, carbonaceous shale, and carbonaceous mudstone below the K-T boundary, in limited areas where up to 3 m of the basal Fort Union Formation is of Late Cretaceous age. The pattern of palynomorph occurrences across the boundary in the Marmarth area reveals several significant aspects of the record of extinction and survival of Maastrichtian plants as represented by their pollen. All 24 of our localities in the southwestern North Dakota study area are described in Nichols and Johnson (2002), but only six selected examples are discussed here: Pyramid Butte, Mud Buttes, Torosaurus Section, Terry's Fort Union Dinosaur, Dean's High Dinosaur, and New Facet Boundary. 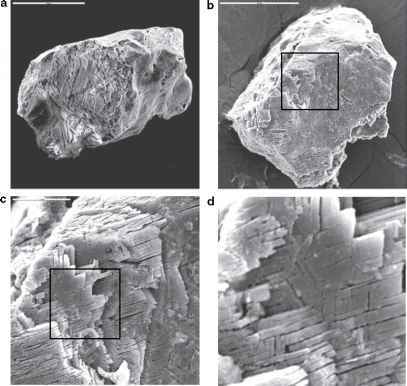 Figure 6.16 Scanning-electron micrographs of etched grains of shocked quartz from the K-T boundary at Pyramid Butte (from Nichols and Johnson 2002). Scale bars in'' a'' and'' b'' equal 50 mm.'' c'' is the area within the box in "b";'' d'' is the area in the box in '' c''. Reprinted by permission. throughout the region. Although the Pyramid Butte locality is one of the most complete K-T boundary sections in southwestern North Dakota, it does not preserve a perfect record of the boundary event. A thin bed of sandstone just above the boundary is evidence of a minor episode of erosion and redeposition just after the event. Erosion and redeposition may account for the presence of rare specimens of K taxa above the boundary at this location (Figure 6.15). 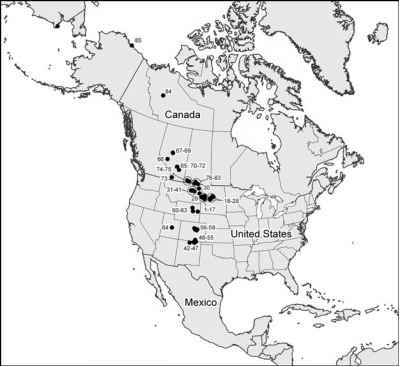 The minor episode of erosion may also account for the magnitude of the iridium anomaly, which is smaller than those recorded at most other K-T boundary localities in North America, and for the absence ofa fern-spore spike. Four ofthe K taxa present at Pyramid Butte were not observed in the uppermost lignite sample, among 2000 specimens scanned. Their absence may be due to the facies effect, that is, the plants that produced them were rare in the mire that formed the lignite. Their absence may also demonstrate the Signor-Lipps effect, discussed previously (see Section 1.3).